Yes, this calendar ends, but mine doesn't. 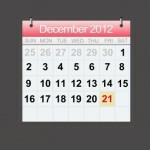 According to the Mayans, today is the first day of…wait, no. That’s not it. Today is the last day. Yes, because the Mayan calendar ends today, supposedly the earth will explode. Or twirl off its axis. Or something. Please. I have a Mickey Mouse calendar that ends in August. Do I think that means September won’t happen? No. And why don’t I think that it will end this year? Um, because every year my calendar ends and the most exciting thing that happens is that I get a new one. So far, once the last page of my calendars turn, the world hasn’t imploded. So there you have it. Absolute proof the world will not end because a bunch of dead guys who invented chocolate couldn’t count past 2012. Or whatever 2012 is in the ancient Mayan world. Do you need more proof? Hello? What about the international date line? 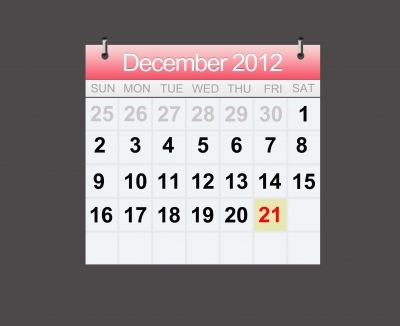 I mean, if the world ends 12/21/12, then do the people on the other side of the dateline get an extra day? Or will they be cheated? Seriously. Those Mayan calendar guys will be held responsible. Sadly, the experts at WWN mainly were worried that their names would be published for telling us all about the Mayans. I don’t blame them. Even if the world does end, you don’t want anyone to know you were a crackpot right before the earth opens and swallows you up. So don’t rush out and buy a new house or new furniture or a new car, just because you think you won’t have to make payments until 2013. After all, my new Mickey Mouse calendar goes well into 2013 and if Mickey isn’t leaving the planet, chances are the world will stay as it is. *Actual headlines on their website. I’m telling you, I can’t make this stuff up.